Fresh data from the three Phase II trials with bemcentinib (BGB324) in non-small cell lung cancer (NSCLC) have been presented at the World Conference on Lung Cancer (WCLC), adding weight to the results reported during ASCO. The data are still early-stage, but continue to indicate that bemcentinib can enhance the activity of pembrolizumab (Merck’s Keytruda), erlotinib (Roche’s Tarceva), and docetaxel. 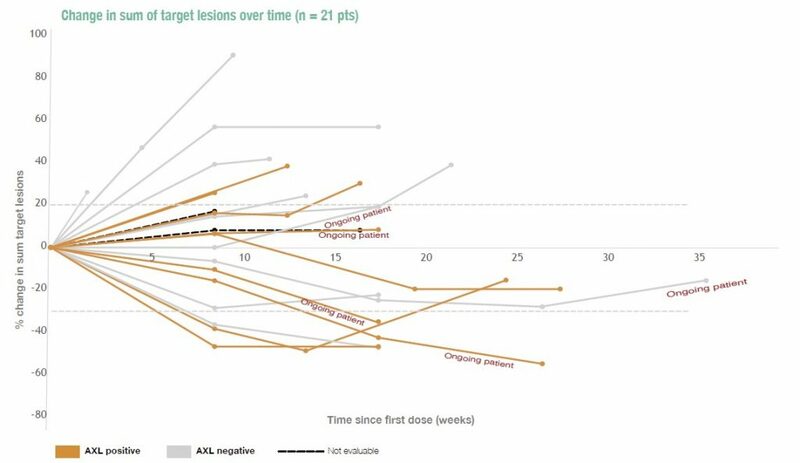 The data from the pembrolizumab trial continue to stand out, with an ORR of 40% in the 10 patients with Axl-expressing tumours, which included those that were PD-L1 negative. 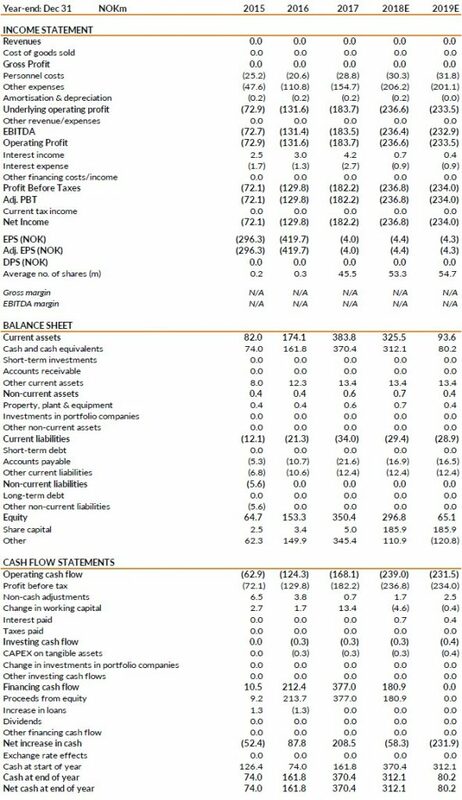 Our valuation of BerGenBio is unchanged at NOK52.65/share. More mature data IO data emphasises potential in this field In the immuno-oncology (IO) setting, data presented during ASCO had already suggested that the activity of pembrolizumab can be enhanced by bemcentinib. The more mature data published at WCLC adds weight to this conclusion. The overall response rate (ORR) from all 24 patients (including patients with PD-L1 negative tumours) was 21%, and 40% in patients with Axl-positive tumours, which compares very favourably to historic pembrolizumab monotherapy data in similar settings. More mature erlotinib/chemotherapy data emphasise broad potential BerGenBio had already presented data indicating that bemcentinib could enhance the activity of the targeted therapy erlotinib and chemotherapy agent docetaxel. At the WCLC, BerGenBio presented PFS (progression free survival) data from the third arm of the trial in the first-line setting in combination with erlotinib; notably the immature PFS benefit is already greater than the 10.4 months seen in the pivotal study for erlotinib in first-line NSCLC. In the Phase II in combination with docetaxel in second-line NSCLC, median PFS was c8.5 months, versus c5.5 months in historic trials with docetaxel monotherapy. Safety profile of bemcentinib remains a key attribute Bemcentinib continues to be exceptionally well tolerated in all three drug combinations. The adverse events observed are similar to those seen without bemcentinib being present, and is probably due to its high selectivity for the Axl receptor. This suggests that bemcentinib’s use will not be limited by tolerability considerations. This is important as bemcentinib’s main commercial potential, emphasised by the efficacy results at WCLC, appears to be in combination with other drugs. Valuation maintained at NOK52.65/share We maintain our valuation at NOK2,880m ($339m, NOK52.65 per share). 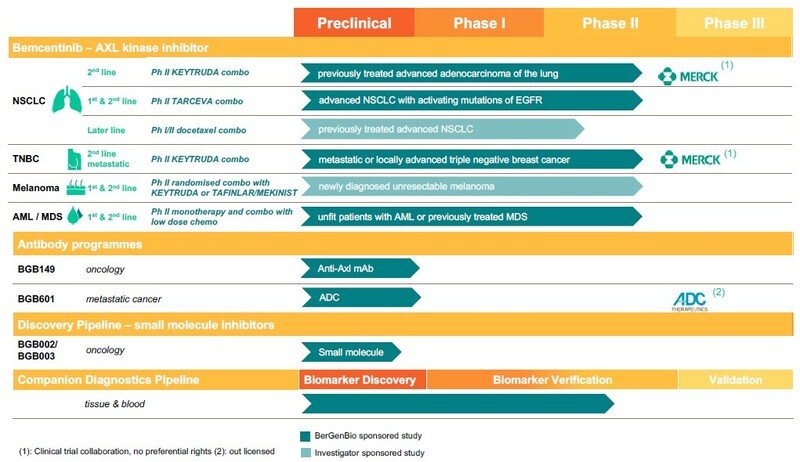 More data is expected to be reported at ESMO in October, and potentially at SITC in November and ASH in December, and ADC Therapeutic is expected to initiate clinical development with BGB601 in the coming months; all of these events could act as catalysts for the shares. BerGenBio is a clinical-stage, drug development company based in Bergen, Norway and Oxford, UK. It is developing innovative anti-cancer therapies that act on the promising Axl signalling pathway. The lead oncology compound, bemcentinib, is in six Phase II trials. Phase II MiST study in malignant mesothelioma with bemcentinib in combination with pembrolizumab and three other treatment regimens (Study Director: Prof Dean Fennell, University of Leicester, UK). These two new trials demonstrate the interest in Axl inhibition and in bemcentinib, the first-in-class selective Axl inhibitor. This interest is likely to continue to grow on the back of the updated data from the three Phase II studies in non-small cell lung cancer (NSCLC) that has just been presented at the World Conference on Lung Cancer (WCLC). The more mature data from this study reinforces the findings from initial results presented during ASCO (see Update note, dated 27 June 2018). Principally, the results show that bemcentinib can enhance the activity of pembrolizumab in patients with Axl-expressing tumours, in particular in PD-L1-negative tumours that would not normally respond to pembrolizumab monotherapy. The updated results of the trial are shown in Exhibits 2, 3 and 4. 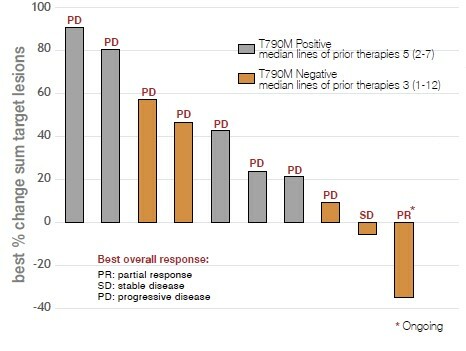 To put these data in context, it is useful to compare them with two trials that Merck conducted with pembrolizumab as monotherapy: KEYNOTE 001, a large Phase I study with various cancers including NSCLC and PD-L1 all-comers; and KEYNOTE 010, a Phase III study in NSCLC comparing pembrolizumab monotherapy versus docetaxel in PD-L1-positive patients only. In the KEYNOTE 001 Phase I study in the 495 patients with NSCLC, the ORR in PD-L1-negative patients was only 8.1%. This compares to an ORR of 27% in the current trial so far, though it should be noted that 66% of the NSCLC patients in the KEYNOTE 001 trial had already received at least two lines of systemic treatment (≥4 lines in 21% of patients), whereas all the patients in the current trial are in the second-line setting. Also, the ORR in the KEYNOTE 010 Phase III trial, which was in a similar setting, was 18% in patients with PD-L1-positive tumours. The ORR of 21% in the current study in the intention-to-treat population containing 24 patients is numerically comparable. However, it should be noted that KEYNOTE-010 was stratified to contain only PD-L1 positive tumours with approximately an equal number of patients with weak and high PD-L1 expression (1-49% and ≥50%, respectively). Consistently, high PD-L1 patients have shown best outcomes, with the highest response rates and survival benefits with Keytruda monotherapy. By comparison, this trial was heavily slanted towards PD-L1 negative (11 patients, 46%) and weak PD-L1 (7 patients, 29%) patients, and contained only 2 PD-L1 high patients (8%; 4 patients were unclassified). 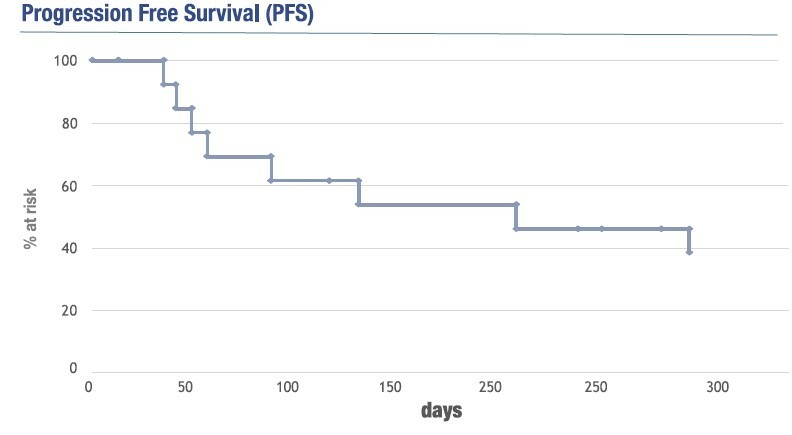 The individual patient response data (Exhibit 4) emphasise the point that those patients that have Axl-expressing tumours are likely to benefit from treatment with bemcentinib in combination with pembrolizumab These data also suggest that progression free survival (PFS) is promising, and we await the formal reporting of the PFS at an upcoming meeting. This trial is still ongoing. 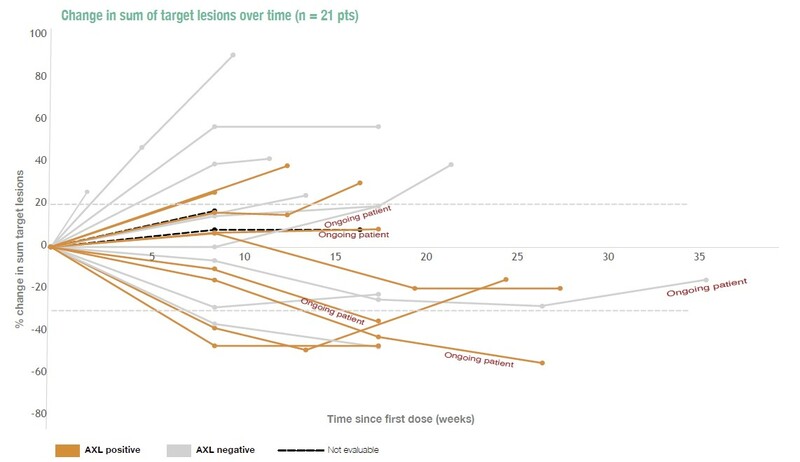 The pre-specified efficacy endpoint for the first stage of the Phase II trial– at least four clinical responses from the first 22 treated patients – was met, so the trial has advanced into the second stage and an additional 24 patients are being recruited under the same clinical trial design. The study in combination with erlotinib was designed to assess the potential of bemcentinib to reverse tumour resistance to erlotinib, or prevent resistance developing initially, in NSCLC driven by mutated EGFR (mEGFR). It had been previously reported that some patients did respond to bemcentinib in combination with erlotinib in the second-line setting. This was confirmed in the poster presented at WCLC (Exhibit 5), supporting the hypothesis that bemcentinib can re-sensitise tumours that became resistant to erlotinib using an Axl driven bypass mechanism rather than the T790M resistance mutation. From a clinical perspective these patients, who account for about half of the patients progressing on first-generation EGFR targeted therapy, have the greatest clinical need; patients with the T790M EGFR mutation are well treated by AstraZeneca’s osimertinib (Tagrisso). This means bemcentinib has most commercial potential in those mEGFR patients without this specific mutation or similar resistance. In the resistance-prevention, first-line setting arm of the study, patients had to have received erlotinib monotherapy for at least 12 weeks without disease progression to enter the trial and receive bemcentinib on top of the erlotinib they were taking. Thus, any tumour shrinkage observed is on top of any benefit that might have occurred, while a patient was receiving erlotinib monotherapy, before entry into the trial. The response data is still immature, and so far, one of the 12 patients in this arm of the trial has achieved a partial response. Of greater interest is the initial PFS data, which seems to confirm that bemcentinib can at least delay development of resistance to erlotinib (Exhibit 6). Median PFS in the pivotal Phase III study with erlotinib in first-line mEGFR NSCLC was 10.4 months. 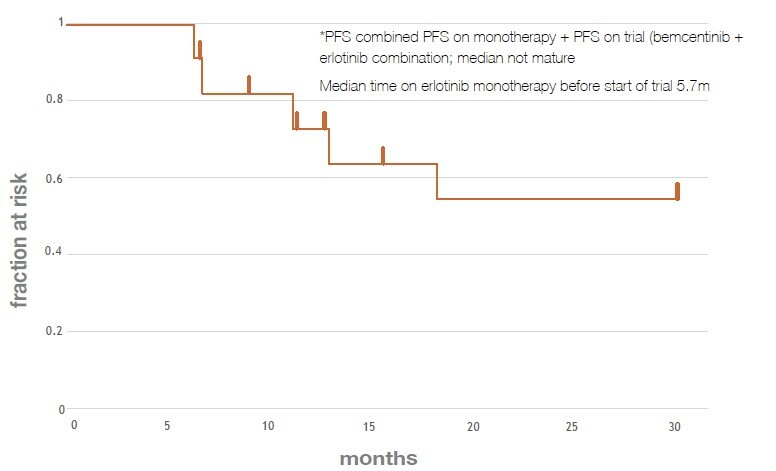 The median PFS data in the current trial has not matured and is already greater than 10.4 month (including the time that the patients received erlotinib as monotherapy, median time 5.7 months). It is always sensible to be cautious about comparing data from two different trials, and this is certainly the case here, as the trial designs for the resistance-prevention arm of the current study and the pivotal study with erlotinib are quite different. But, the data from this trial is promising, and in our opinion, would justify advancing the development of bemcentinib in this setting (with erlotinib or other EGFR inhibitor) into a larger Phase II study to get a better understanding of bemcentinib’s ability to delay/prevent the development of resistance to an EGFR inhibitor. The new data, including the PFS data, from the Phase II trial with bemcentinib in combination with docetaxel in adenocarcinoma NSCLC suggests more clearly that the two compounds work synergistically (as demonstrated in preclinical studies), with bemcentinib delaying development of resistance to docetaxel. The ORR in this study to date is 18%, with two partial responses seen amongst the 11 patients treated so far (trial is ongoing), this compares to an ORR c5% normally seen with docetaxel monotherapy (Exhibit 7). Also, median PFS is c8.5 months in this study, vs 5.5 months with docetaxel monotherapy in historic trials (Exhibit 8). The potential of combining bemcentinib with chemotherapy is being studied further in an investigator-led study in pancreatic cancer due to start shortly. It should be noted that across all the studies bemcentinib continues to be extremely well tolerated. The adverse events observed in all three trials are very similar to those you would expect during a trial with either pembrolizumab, erlotinib or docetaxel, respectively, as monotherapy. At this stage, it appears that the compound can be used in combination with any other therapy from a tolerability perspective. This is an important aspect of bemcentinib’s profile, being highly selective for the Axl receptor, as its greatest commercial potential is probably from use in combination with various drugs. We are maintaining our valuation of BerGenBio at NOK2,880m ($339m) or NOK52.65 per share. While the new data is largely supportive of bemcentinib’s potential in a broad range of oncology settings, we maintain our conservative stance. 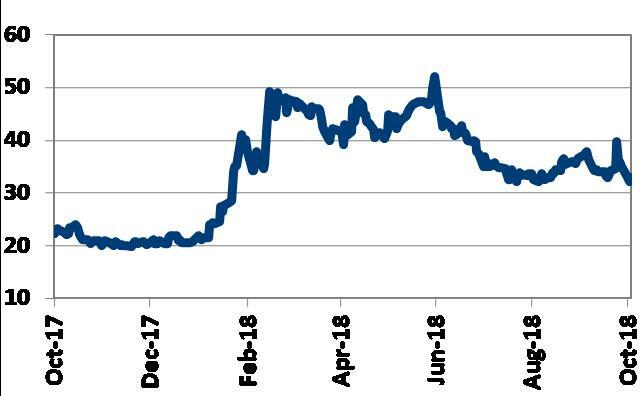 Our valuation excludes any consideration for bemcentinib/BGB149 in fibrosis indications (see Update note dated 9 May 2018) or the antibody-drug conjugate BGB601 that is due to enter clinical development within a year.